The beginner’s floral artwork may portray flowers as having bright colours such as pinks, oranges and reds. The flower heads look flat and idealistic, the same flower head shapes echoing throughout the painting. In an attempt to give the flowers form, the artist may introduce black or dark brown into the colour mix, resulting in dirty colours. Dispelling beginner’s mistakes as described, will take the floral artist a long way towards painting more satisfactory botanical art. Never try to darken a bright colour with black. It is better to darken a colour with its complimentary colour, which is the opposing colour on the colour wheel to a given colour. The complimentary colour of red, for instance, is green; the complimentary colour of yellow is violet. Applying a neutral-coloured wash of diluted acrylic paint prior to painting flowers will help the artist measure the tonal values of flowers, as opposed to applying bright colours straight onto a white painting surface. Observing flowers out of their normal context, such as next to rusty tools or from an unusual viewpoint, such as from above, will help the artist get a fresh view of flowers. Experimenting with different artist painting mediums will provide a multilayered feel to a painting of flowers. Mixing linseed oil into a colour mix and applying it over a dry area of paint will provide an effect like tinted glass. This oil painting technique is known as “glazing.” To emphasise texture, impasto medium can be mixed with the oil paint and applied onto the flower heads to make them appear to stand out of the painting. 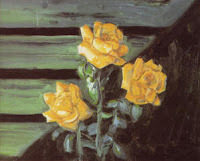 The primary colours must be included within the artist’s palette when painting flowers. These are labelled differently according to the paint manufacturers. Some include the word “process” or “permanent” with the hue name. In oil paint, permanent rose, cadmium yellow (pale) and pthalo blue will provide clean secondaries such as orange and violet hues. White with a hint of burnt sienna will provide brilliant creams often seen in bedding plants. Viridian green, a garish green on its own, will provide beautiful greens if muted with burnt sienna, burnt umber or permanent rose. However, keen observation will reveal that any colour can be found in flowers, some of which will surprise.